Over the Christmas holidays we watched "Schindler's List" again. 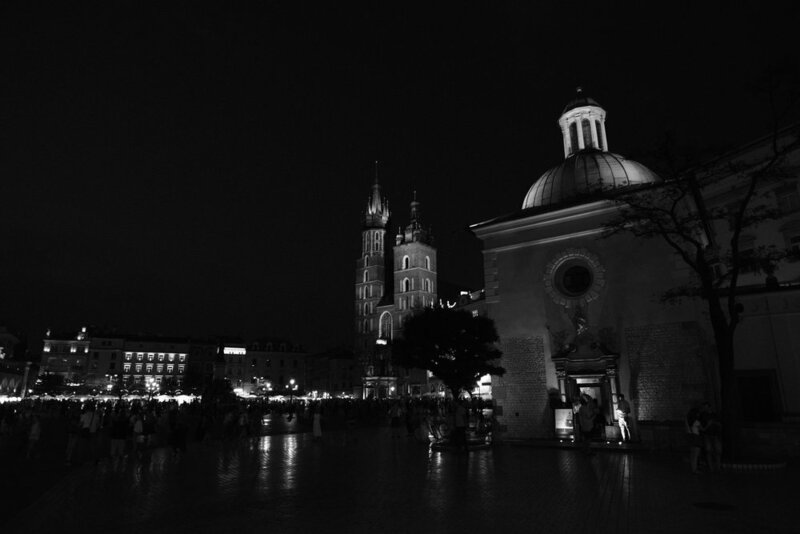 Stephen Spielberg's movie from 1993 documents events in Kraków during the second world war. The Zookeeper's Wife, another historically based film from 2017 about events in Warsaw solidified Poland as a destination we wanted to explore. Our ten hour bus from Berlin was an hour late and as we dragged our feet and backpacks though the very modern mall adjacent to the train station and market square we were a bit disappointed. It felt as if we had landed in a north american metropolis merged into a modern beehive of a tourist trap. A good nights sleep, a solid breakfast and the city seemed much more appealing as we ventured out for the day with a more positive outlook. The market square, the largest medieval square in Europe, is indeed impressive with St. Mary's Basilica and the Cloth Hall. It is also a tourist hub on steroids with brand name chain stores, countless horse drawn carriages and tourist fluff. This undeniably takes away from the original medieval scene. 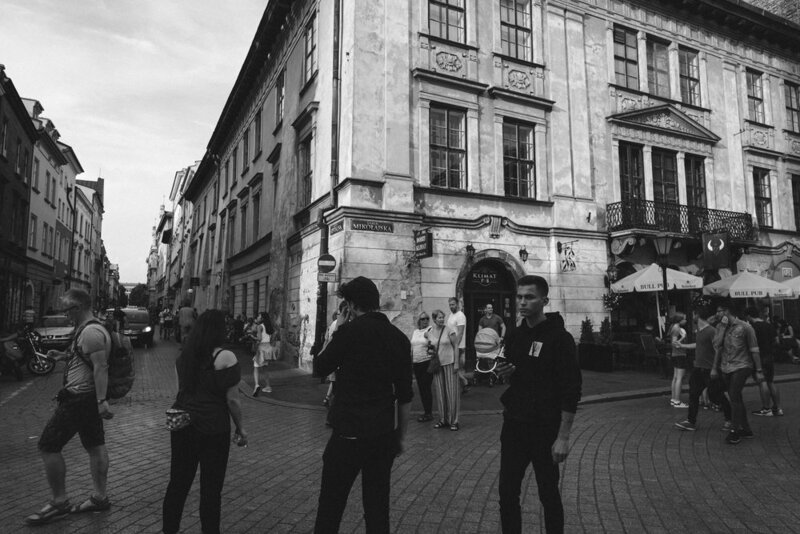 We decided to head to the Jewish quarter of Kazimierz and it felt more authentic with each step. We often seek out photography exhibits and a visit to the Galicia Jewish Museum was first on our agenda. It was a moving collection of colour photographs illuminating the years after World War II until now; portraying the decline of the Jewish presence in Poland and current activities. Photos of worn down and abandoned synagogues, mass graves and a section from the Auschwitz and Birkenau concentration camps. We left in a somber mood and walked on to debrief. We wandered the streets, took in the atmosphere of the warm summer evening and settled on an Armenian wrap from a street market for dinner. 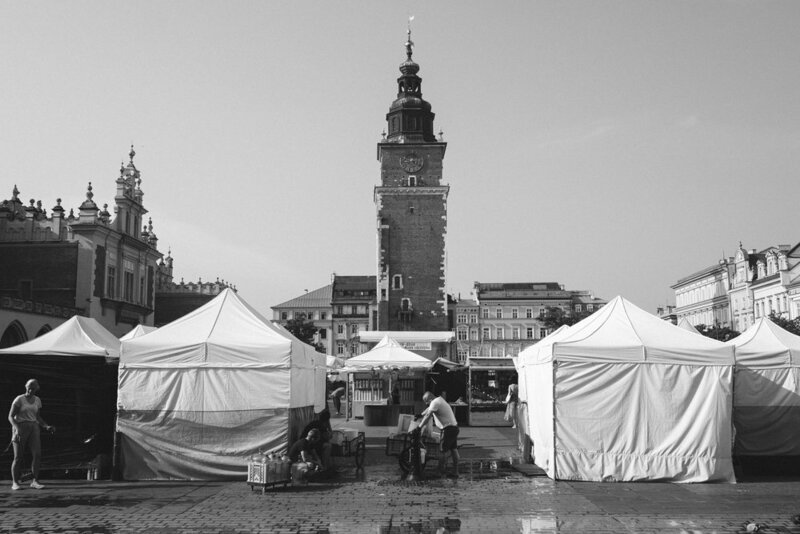 It was a busy weekend in Kraków, at the peak of the tourist season. Day two. Back to the train station to secure our tickets to Kiev for the next day. 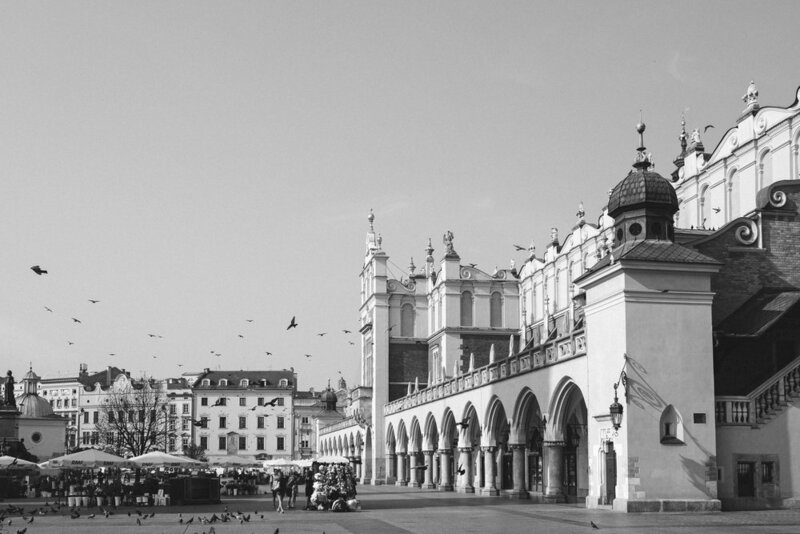 All of the direct routes from Krakow were sold out, which made the decision to take the overnight train through Warsaw that much easier. With Spielberg's movie in mind, we sought out the Oscar Schindler Factory museum. Located in Schindler's original enamel factory the museum is an interactive display of life in Krakow from 1939 to 1945. 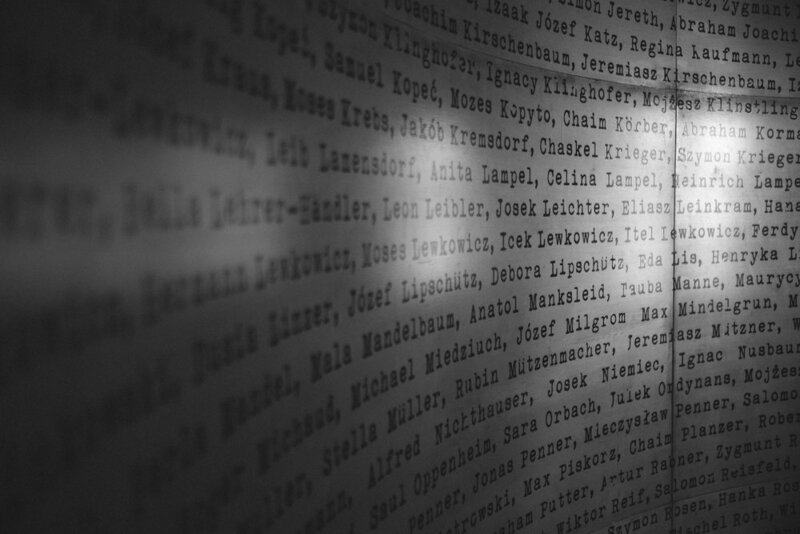 It was especially moving to see a monument with the names of the 1200 Jews Schindler saved. 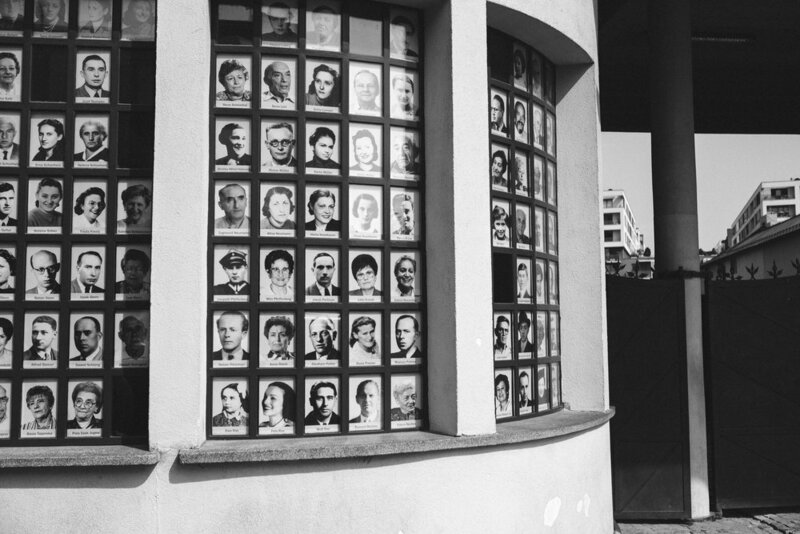 You may recognize the photo below from the entrance to the factory with portraits of the employees.